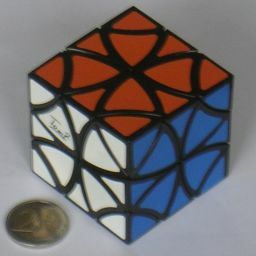 The Helicopter Cube is a cube-shaped puzzle in which a normal move consists of twisting part of the cube around the midpoint of an edge by a half turn. The part of the cube that twists during a move is shaped like a triangular prism, with its cutting plane parallel to an edge and cutting through the midpoints of the two adjacent faces. All twelve edges can be twisted this way, so the cube is divided up into 8 corner pieces and 24 triangular centre pieces (4 on each face). The Curvy Copter is a variant on the Helicopter Cube in which the cutting planes are curved. The effect of this is that each edge has an extra central piece. These extra pieces do not change position but their orientations do change, making this a more difficult puzzle. It was designed by Tom van der Zanden (TomZ). A very interesting property of these puzzles is that they "jumble". Part way through a move, some of the adjacent edges suddenly become free to move. If you move these adjacent edges and mix it further in this way, then its shape changes and some axes can become blocked from moving. 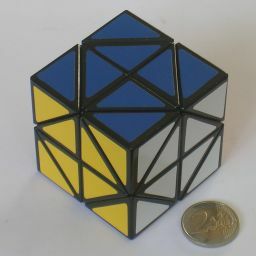 Even if you get it back into a cube shape, it is quite likely that it is not possible to solve it again without jumbling. This gives a total of 7!·36·6!4 / 2 = 493,694,233,804,800,000 positions, all of which can be reached. This gives a total of 8!·37·6!4·26 = 1,516,628,686,248,345,600,000 positions, all of which can be reached. This gives a total of 7!·36·24! / 4!6 = 11,928,787,020,628,077,600,000 cube-shaped positions, all of which can be reached. The row marked Order shows the sizes of the symmetry groups. The Index is the index of the symmetry group as a subgroup of the full cubic symmetry group, i.e. it is 48 divided by the order. The index is also the number of ways any particular shape with that symmetry can be oriented in space (including reflections). The first Shapes row lists the number of shapes that Matt found for each symmetry group but not counting mirror images, and the second Shapes row includes the mirror image shapes in its count. The row marked Total is the product of the index and the number of shapes. Combining this with the previous result, we find that there are 654,117 * 7!·36·24! / 4!6 = 7,802,822,379,572,176,235,479,200,000 jumbled positions all together. It is a little surprising that this last parity constraint still holds when the puzzle is jumbled, but it is due to the fact that a move will always involve two corner pieces on opposite sides of the edge centre. This gives a total of 8!·37·24!·212 / (4!6·2) = 586,323,739,637,911,270,195,200,000 cube-shaped positions, all of which can be reached. Calculating the number of positions of any shape is a little easier than with the normal Helicopter cube. We do not have to take symmetry into account because the edge pieces make the orientation of the puzzle visible. The previously mentioned work by Matt Galla shows there are 28,055 shapes, as there is no difference between the normal Helicopter Cube and the Curvy Copter as to what moves are blocked or available in each shape. Note however that there are some moves that are blocked but which can be done by forcing pieces past each other, but such moves are not taken into account here, and such moves may lead to otherwise unreachable shapes. We can calculate the total number of jumbled positions by multiplying the number of shapes by the number of piece arrangements, as the latter is the same for all shapes including the cube shape. We therefore have 28,055 * 8!·37·24!·212 / (4!6·2) = 16,449,312,515,541,600,685,326,336,000,000. Denote the 6 faces using the letters F, B, U, D, L, R for the Front, Back, Up, Down, Left, and Right faces. The edges can be uniquely labelled using the two letters of the faces that meet at that edge. For example FR is vertical edge shared between the Front and Right faces. The same two letter labels will also be used to denote 180 degree twists of the edges, so FR also means a half turn of the pieces around the front-right edge of the cube. It is often useful to label the locations of the moving pieces. A corner location can be labelled using three letters, e.g. URF is the corner shared by the Up, Front and Right faces. The face centres will also be labelled with three letters, an upper case letter for the face it is in, and two lower case letters for which corner of that face. The four centre piece locations of the top face are therefore Ufr, Ufl, Ubl, and Ubr. Phase 1: Return the puzzle to a cube shape. Do any moves you can to get the shape closer to being a cube. Examine each edge, and twist it to its normal orientation if possible. This is easier on the Curvy Copter because it has visible edge pieces, but even on the Helicopter Cube these is a hidden edge piece at the top of each axis of the mechanism. Try to figure out how to twist each axis to align this hidden piece. If you have done the previous step correctly, then the pieces that stick out come in pairs - always a corner and a centre piece together. Furthermore, there will be an even number of such pairs. Rotate the cube or do any moves necessary such that one pair lies at UFL, and another at UFR. Luf, Rfu: UR UB, and try steps c,d again. Ufl, Fur, or Ful, Ufr: I haven't found a good way to resolve this case. Let me know if you have. The following phase needs some further explanation. Consider any face centre piece, and imagine where it can move to using normal move. There are always only two moves that affect the piece, so after the first move it can only move in one direction to a new location. This results in a loop of 6 locations around the cube that the piece can move to. For example, the piece at Ufr can move to Flu, Ldf, Dbl, Brd, Rub, and then back to Ufr again. This is a ring of six locations, one on each face. There are four of these rings, each with one location on each face. The six pieces in such a ring can be mixed, but can never leave their ring if you do only normal moves. If a cube has not been jumbled, then each ring must contain one piece of each face colour. After jumbling this is no longer true, so this will be resolved in the next phase. Phase 2: Make the face centre rings contain all six colours. Find any ring that contains (at least) two pieces of the same colour. Remember that colour. Find any other ring that does not contain a piece of that colour. Hold the cube such that the Ufr location is part of the first ring, and Dfr is part of the second ring. Using only normal moves, bring one of the two pieces of the same colour to the Ufr location. Examine the second ring, find out which colour occurs more than once, and then use normal moves to bring a pieces of that colour to the Dfr location. Note that you need not disturb the Ufr piece for this. Choose a colour for the bottom face. If you have a Curvy Copter, then find the four edges with the chosen colour. Turn those edges so that they have the chosen colour in the same face, and then hold the cube with that face on the bottom. On a normal Helicopter Cube it does not matter which face is held at the bottom. Find any centre piece of your chosen colour that does not already lie in the bottom face. Using normal moves, and without disturbing the bottom face, bring the piece to the lower half of the cube. Hold the puzzle so that the piece lies in (the bottom half of) the front face. Repeat steps c-f until the bottom face centres are all of the chosen colour. Find any unsolved corner piece that has the bottom face colour on it. Determine the location where the corner piece belongs. On a Curvy Copter, you must look at the side colours of the bottom edges to determine where the corner should be placed to match those colours. If you are using a normal Helicopter Cube and this is the first corner to be solved, then you can choose any of the four bottom locations. For later corners you must use the first corner as your guide for where to place them. Without disturbing the bottom face centres, use normal turns to bring the corner to the location in the top face directly above the location where it belongs. Hold the puzzle so that the corner piece is at URF, and the location it belongs below it at DRF. Repeat steps a-e until the bottom face corners are all solved. Hold the cube with the solved face still at the bottom, and so that the bottom-right centre of the front face (Frd) is unsolved. If all the side faces have their bottom-right centre solved, then skip ahead to step g.
Find the centre that belongs at Frd. It must lie at one of the locations Ruf, Ubr, Blu, Ldb. Use top layer moves to bring the centre to the Ruf location. Insert the centre piece with the moves FR UF FR UF FR. Repeat steps a-e until the bottom-right centres of all four sides are solved. Hold the cube with the solved face still at the bottom, and so that the bottom-left centre of the front face (Fld) is unsolved. If all the side faces have their bottom-left centre solved, then skip ahead to step l.
Find the centre that belongs at Fld. It must lie at one of the locations Luf, Ubl, Bru. Use top layer moves to bring the centre to the Luf location. Insert the centre piece with the moves FL UF FL UF FL. Repeat steps g-j until the bottom-right centres of all four sides are solved. On the Helicopter Cube this phase is now finished, and you can skip to the next phase. On the Curvy Copter it may be that some the middle edges are flipped. Hold the Curvy Copter cube with the solved face still at the bottom, and so that the front-right edge is flipped. Do the move sequence FR UR UF FR UF UR FR to flip the edge. Repeat steps l-n until all middle edges are correct. Find the corner that belongs at URF, which is the corner piece that has the same colours as the front and right faces. Use top layer moves to bring that corner piece to the URF location where it belongs. Find the corner that belongs at ULF, which is the corner piece that has the same colours as the front and left faces. Use UB and UL moves to bring that corner piece to the ULF location where it belongs. If the UBR and UBL corners need to be swapped to be in their correct positions, do a UB move. Turn the whole cube to the left, so that the right face becomes the front. Repeat steps a-b, so that you will have solved the sides of the front half of the cube. Turn the whole cube around, so that the back face becomes the front. If the Ubr centre location is not yet solved, do (UR UF)3 to solve it. If the Ubl centre location is not yet solved, do (UL UF)3 to solve it. If the Ful and Ufr locations are not yet solved, then do UR FR UF (UR FR)3 UF FR UR. 2. To flip the UF and UR adjacent edges: UR UF FR (UR UF)3 FR UF UR, UL+ FR+ UF FR- UL-, UR- FL- UF FL+ UR+.